Eight inch quilt blocks are commonly used in quilts that are made up of one block only and the parts are easily divisible by four. Also, by setting the blocks in different layouts, you can create many different new designs -- sometimes with just a simple rotation of the block. This is not to say that larger or smaller versions of the same quilt block cannot be used in your quilt. Once again, you are the designer. 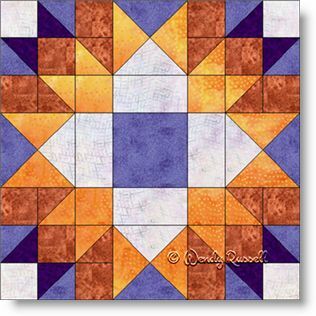 Divided Cross is a quilt block for those who would like a little more of a challenge. Now having said that, this block is only challenging -- not because it is difficult -- but because of the number of pieces in each block. Other than single squares and rectangles, the other individual patches are common ones -- the half square triangle and the quarter square triangle. To make your quilt go together quicker, I would suggest making the 16" block, and therefore there are less blocks to construct. Also I have chosen to use the uneven nine patch as my method of construction, as I prefer to work in "chunks" rather than individual rows. As you can see from the sample quilts illustrated, you can make some really striking quilts. The straight set quilt shown has sashing strips between the blocks which leads to a secondary pattern. Your individual colour choices are the key to making your quilt look like no other.